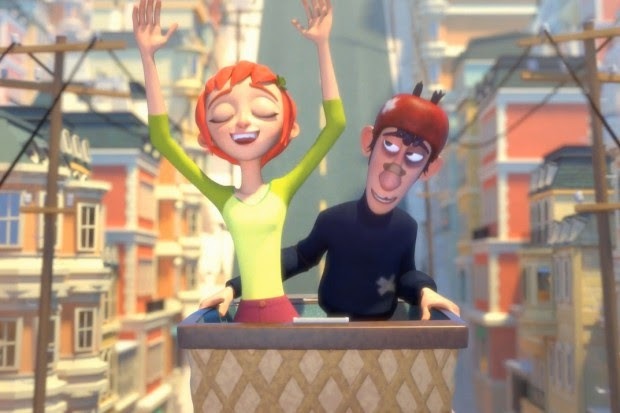 Michael Bidinger and Michelle Kwon, graduates of Ringling College of Art and Design, have been so kind as to release their award-winning short Jinxy Jenkins, Lucky Lou to the Internet. This is high-quality animation that you don't want to miss! The exceedingly unlucky Jenkins and the eternally lucky Lou run into each other one morning. It turns out that opposites really do attract, and the two experience a thrilling adventure that is new for both of them in terms of their usual degree of luckiness. Together, they roll down the hills of San Francisco in an ice cream cart. "Jinxy Jenkins, Lucky Lou" was produced by Sarah Kambara. It has a bright and bouncy feel to it, a good vibe and some quite effective animation that is fairly simply but ideal for its visuals. Perfect choice of background music, too. Give this one a whirl, it is worth your 3:52. Hamburg Animation Festival (Hamburg Animation Award & Audience Choice Award). The film has pages on Facebook (/jinxyjenkinsluckylou) and Tumblr (jinxylucky).